Unlike all other temples, the deity at the Poruvazhi Malanada Temple is Duryodhana, the antagonist of the Indian epic Mahabharata. Another striking feature of this temple is the fact that the temple doesn't have either an idol or a sanctum sanctorum. A spectacular event that is a part of this temple is called Malanada Kettukazcha. It is a one-day festival celebrated in the month of March. A fascinating sight in which decorated structures are taken out to the accompaniment of traditional orchestra of drums, the procession attracts scores of people every year. 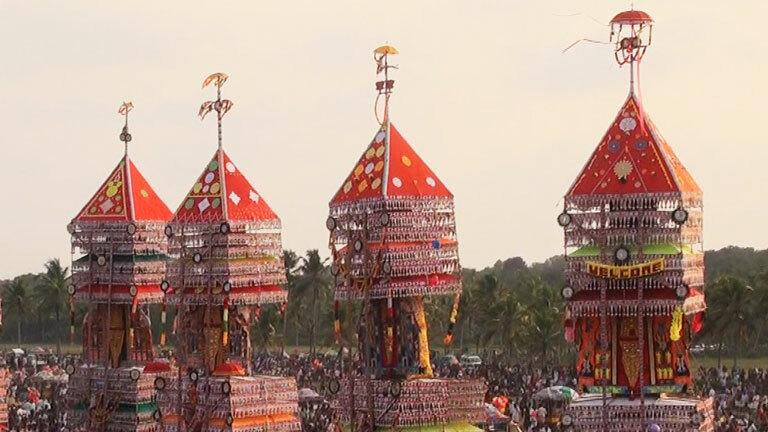 Some of these decorated structures made in a competitive spirit by the people of the surrounding villages are 70 to 80 ft tall. The structures are either carried on the shoulders or taken out on chariots. The sheer grandeur of this procession is what has earned it its repute and fame.